It may not be a Christmas show, but there is still a seasonally comforting familiarity to the Gilbert and Sullivan gems that make up The Mikado. The comic opera's timeless wit alongside melodies hard wired into every educated English-person, make for a show that one cannot help but smile throughout. 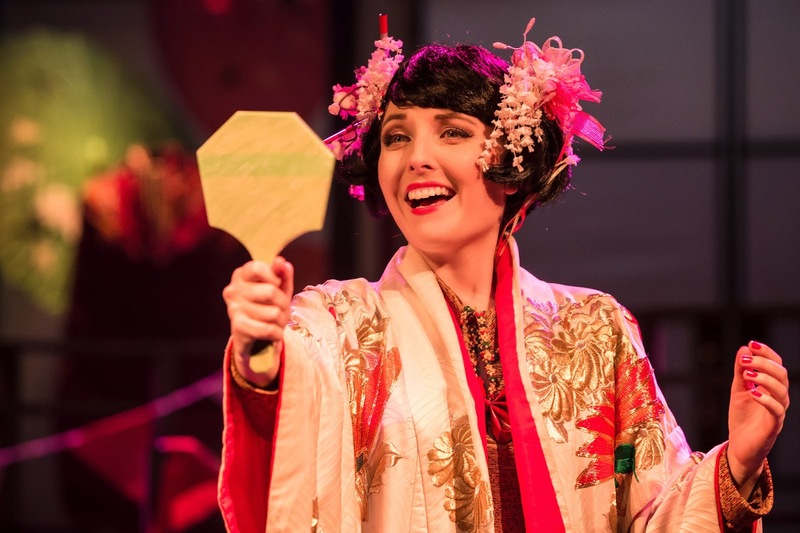 Thom Southerland has set the 19th century work firmly in the roaring 20's, with flappers and jazz-hands making it a Thoroughly Modern Mikado. Whilst the costumes may bizarrely range from spats and bowlers through to kimonos and a Juan Peron lookalike Mikado, everyone looks sumptuous. Aside from costumes however there is an all-pervading air of budgetary restraint. This most clever of scores has been economically re-arranged for two pianos and notwithstanding the excellent ivory tinkling of Dean Austin and Noam Galperin, there is a timbre and a texture to Sullivan's tunes that is lost in the reduction. Vocally too and with no-one mic'd, there is an apparent gulf in ability between the actors who have an operatic background and those more usually reliant upon amplification. That Matthew Crowe's delightfully foppish Nanki-Poo is occasionally inaudible (and this from a front row seat) is unforgivable. Likewise Hugh Osborne's Ko-Ko is a treat of a characterisation, but far too often his tuneful voice lacks projection. Mark Heenehan however brings just the right amount of blustering buffoonery to the title role. The performing excellence of this production lies with its women. Rebecca Caine's Katisha is a masterclass. Her vampish, vulnerable and (sometimes) baddy is a flawless display of perfection in her craft, her voice filling the auditorium and her presence, alongside hilarious poise and facial expression, stealing every scene. Credit too to Leigh Coggins whose Yum-Yum also belies a career history in opera and whose voice often soars (delightfully) above those of her singing partners. There are moments of sweet genius in this Mikado. Make sure to sit near the front and revel in some wonderful songs you've known since childhood.